If you ask any tea connoisseur/expert/lover about Taiwanese tea, you are likely to hear about two specific kinds: 鐵觀音 Iron Buddha (TieGuanYin) and 高山烏龍茶 High mountain oolong. If you walk into a tea shop and approach the owner sitting at a table unlike one in the picture above, they will absolutely ask you to sit down and offer you some tea. I started to study Chinese at ShiDa Mandarin Training Center 2 years ago and completed 9 months of classes. Regularly throughout that period I would sit down with tea shop owners and practice Chinese, drink tea, and talk about anything and everything we could. I cannot recommend this enough as a learning experience. 梨山高山烏龍茶 LiShan high mountain oolong. The flavours in this tea are clean, crisp and delicious. I like this tea so much that it is one of the only ones I will buy for my tea set at home. When I drink it at home it has a fruity flavour, predominantly apple. 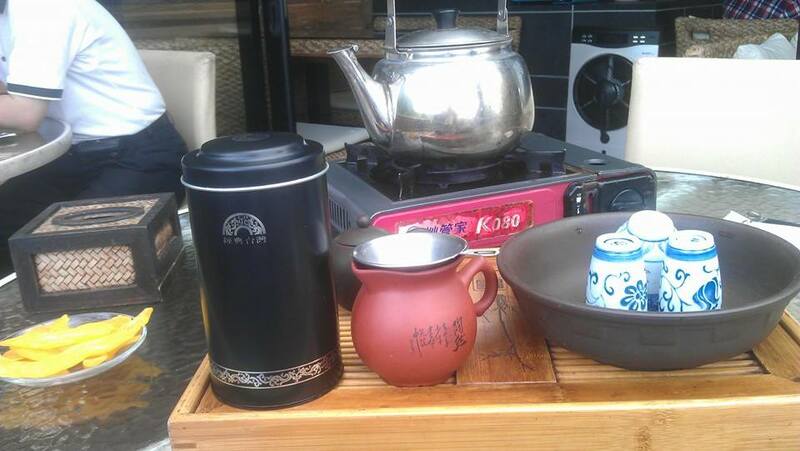 It also has the characteristic milky flavour that oolong has become famous for. However, sitting down with the tea shop owner this time, he likened the flavours to freshly cut apple and freshly cut pear. If you cut the fruit in half and smell the inside of the fruit, it’s that kind of flavour. He hit the nail on the head! 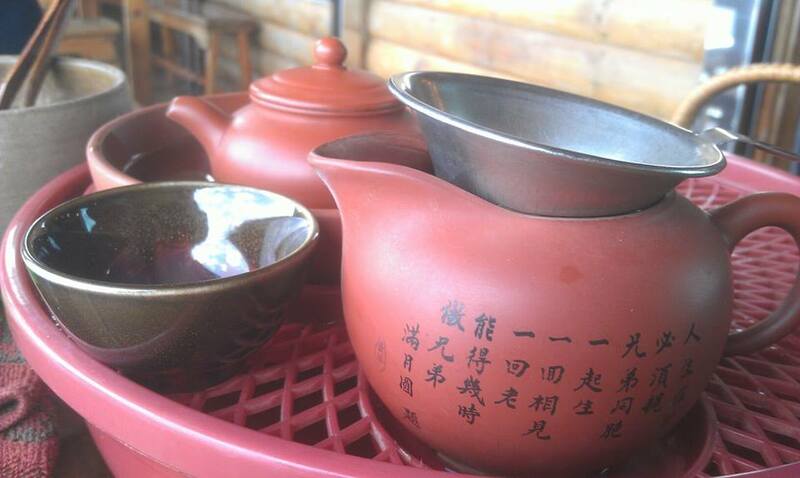 PuEr tea is preserved in a way where the tea is packed into a ‘cake’ and stored for a long time. As a general rule of thumb – the older the cake, the more expensive the tea. I am going to guess that this tea is worth upwards of $10,000TWD. This is known as the ‘smelling/aroma’ cup. The tea is put into the long smelling cup and then it is upturned into your tea cup. You should then pull the cup up and let the tea flow into the tea cup beneath, as the aroma of the tea fills your ‘smelling’ cup, you should get your nose in there and have a good sniff. Just like a fine wine or whisky, you can test yourself to find the different aromas and then confirm them with the brewer of the tea. Usually they will join you in drinking the tea, this is when you know the quality is really good! When the smelling cup has been disposed of, now it’s time to take a drink. ‘Slurping’ the tea is said to be the best way to get a taste for the different flavours as it is said to release the oxygen from underneath your tongue and to properly coat your mouth with the tea flavours. However, in the west it is deemed rude to slurp your drinks. Note: We are not in the west, we are in Taiwan. Slurp that tea and taste those flavours! Comparison of teas – from left to right: AliShan red oolong tea, PuEr tea and LiShan high mountain oolong tea. 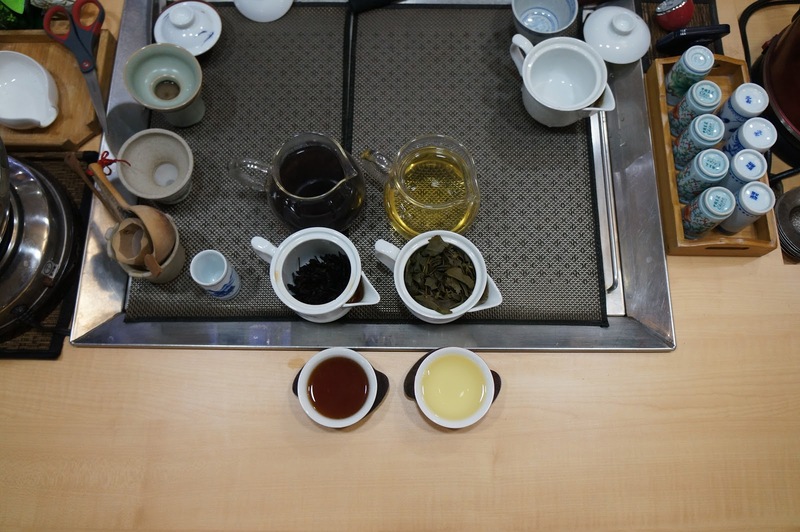 Tea in Taiwan is used in a multitude of different ways. Here’s my recommendation: go to a tea shop and taste some of the tea, then buy a bag of what you like. Get a french press/cafetiere (traditionally for coffee, of course) and add enough tea leaves to the bottom so as they are 2 rows deep. Now, pour hot water over the top and leave the plunger at the top. Allow the leaves to expand a little for 30s, then pour out the water, retaining the semi opened tea leaves inside. This time, fill up with water again, wait 50s and plunge the plunger down. Drink the tea, and repeat some more. If you order tea in Maokong, this is what you’ll get, if you don’t know how to use it, just ask! How many times can I use the same leaves? For a high mountain oolong tea, you can get 6-8 pulls from one pot, so don’t go throwing your leaves away after just one pot! If you don’t want any more tea, then continue to brew it there and then but just put it into a flask or a separate jug and have it cold later. For a good quality PuEr tea, you can get anywhere between 10-15 pulls off of that, so definitely make sure you’re not wasteful in throwing it away. How can I choose my own Taiwanese teapot? This is a tough one, because there are so many different kinds. I would suggest an enamel one like the white one in the pictures above. The size of that one is for 2-4 people, so it’s an ideal size, too. You should only clean your pot with hot water, never soap! Alternatively, you could go for a more traditional teapot like the ones in the first picture at the top of the article. However, make sure to season the pot, first: brew your first pot of tea and do not drink it. Leave it for 24hours, wash it out with hot water, and now it is good to go. 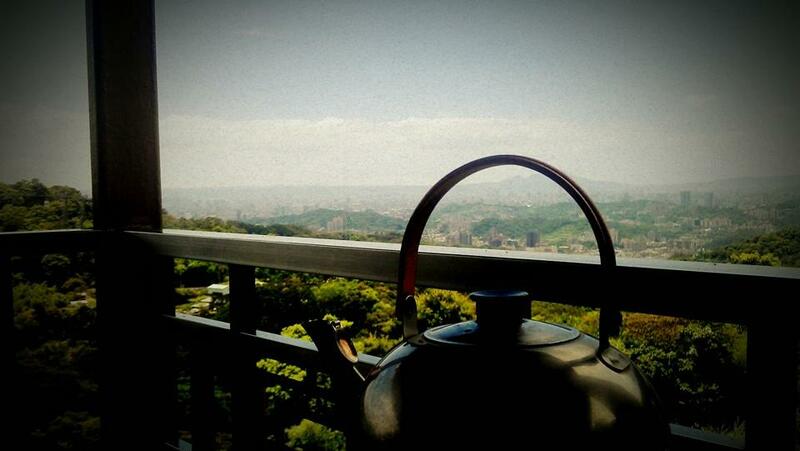 Maokong is still my favourite place – killer view and killer tea! I am happy to answer any questions about tea, just throw them over to eatingintaipei@gmail.com, or leave a comment on this post.